Plot: Johnny and his parents are out on a day-trip and he has completed a circular ‘building’ with his ‘building bricks’. As his mother rests by a large stone formation his father demands he hurry up so they can get off home. Johnny is pleased with his effort which his parents praise as ‘unusual’ and ‘imaginative’. Thoughts: A real disappointment of a Future Shock from two talents who had previously produced excellent tales. Cruden’s story is a less interesting re-hash of FS 11 with building bricks / Stonehenge replacing The Moon / Billiard Ball as the object of ‘the problem of scale’ scenario. Cruden’s strip, which once again places a young subject the age of the readership at the core of the tale, has a tough time of convincing that the stones of Stonehenge were once ‘building bricks’. The family are shown in 60s/70s clothing so large lumps of stone seem a curious childs toy for such an ‘advanced’ civilization. However while the script is barely re-fried seconds the art really jars and ensures this is a story to be forgotten. 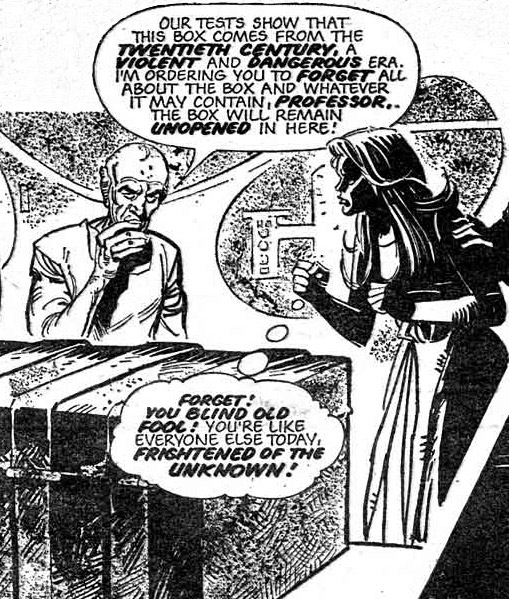 Trevor Goring’s final appearance on art chores in a Future Shock is a real let down, the various family members all appear static and light-boxed from photo-reference; the mother in particular straight from a 70’s Freemans catalogue. Even more frustrating their positions relative to each other continually changes from panel to panel in contrast to the flow indicated by their dialogue. A final oddity is that in one panel the mother seems pressed, in fashion-faux ecstasy, up against a giant rock face.. therefore one that is presumably 100s of miles higher than the tiny ‘Stonehenge’ being built at her feet. Strangely his granite mountain doesn’t appear to have survived to 1978’s Salisbury Plain while some tiny ‘building blocks’ have. Given how excellent his other two strips were the art here must have been down to some external factor such as time pressure or toying with a new technique. 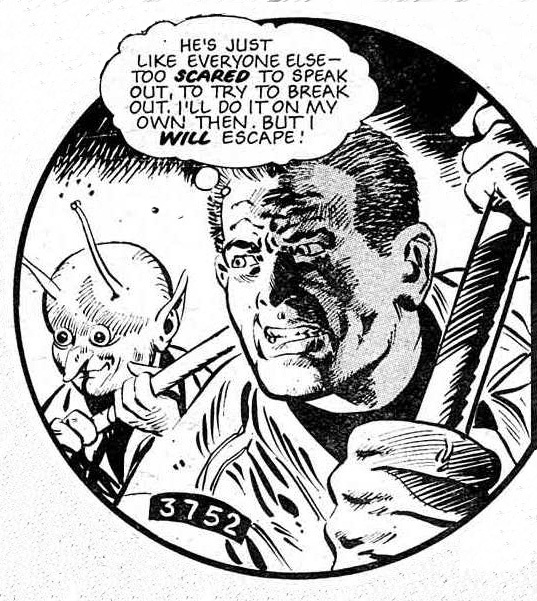 Those wishing to see just how good a 2000AD artist Trevor Goring could have been should look to his previous two Future Shocks. Shock’d? : Cruden’s regular focusing on characters of the same profile as the reader may have engaged the then readership with the story and delighted with the ‘shock’ but to a contemporary audience the whole family are dull, lacking character and frankly boring. 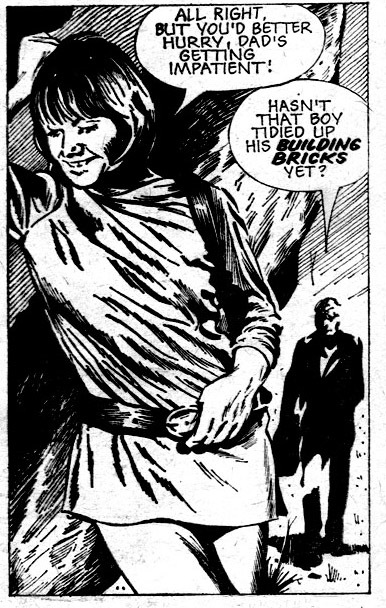 That the son builds Stonehenge is mildly amusing at best but, like the whole of the strip, poorly executed compared to both FS 11 and it’s subsequent third rehash (Dominoes / Stonehenge) in Prog 371’s The Domino Theory.